Big data promises to manage your complex business to make better decisions. But the technology services that run your business are also complex. 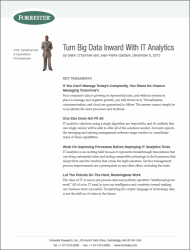 This Forrester report helps leaders prepare for IT analytics that turn big data efforts inward to manage the technology services that run your business. Register now to get the full report.